Last week, I had a meeting with Yohan's teacher regarding his shortcomings in terms of writing... Yes, shortcomings talaga, big word LOL. We discussed a lot of things, like Yohan's behavior, that according to Teacher L he is "malikot, laging nakatayo, at hindi nagsusulat". She said that he might need a tutor who will focus on teaching him how to write. The tutorial class in their school will start next month. While waiting for the start of tutorial sessions, I am doing my best to help him in practicing handwriting at home. I am using various techniques to encourage him to love writing. As I observe, Yohan finds writing as a complicated task. Tracing, copying sample words, and coloring are just few of the activities we do during our study time. He needs to practice more on following the lines on the paper for the proper way of writing big and small letter. 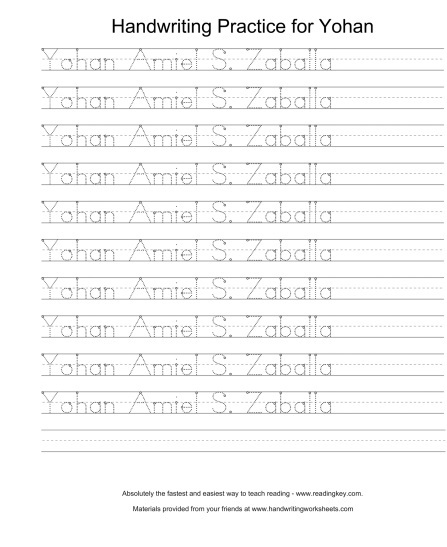 I am glad I found this useful website for creating handwriting practice sheets. This will make our job much easier hehe. The website I'm talking about is www.handwritingworksheets.com/. Here's one of the practice sheet I printed a while ago. I'm excited for our handwriting tutorial later. Who knows, Yohan will enjoy and learning writing before the month ends and we don't need a tutor anymore. Let's see!